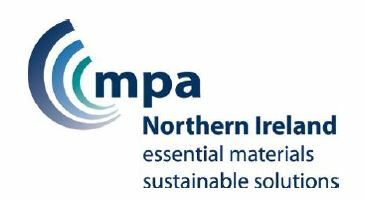 QPA Northern Ireland (QPANI) which was formed in 1998 has taken the decision to change its name to MPA Northern Ireland from 1 January 2019. QPANI is the trade association for the mineral products sector in Northern Ireland with 87 members employing just over 5000 people contributing almost £700 million to the Northern Ireland economy. It has been an affiliate of MPA since 2009 and now, after a full consultation process the Members of the Association have given unanimous support and endorsement to rebrand to MPANI. “QPANI has been a valued and important member of both QPA and latterly MPA ensuring that our work is genuinely national taking account of issues across the UK. QPANI makes an important contribution to our policy thinking and are a professional and energetic association in their own right. We are absolutely delighted that they have decided to adopt the MPA name which will strengthen the important ties between our two organisations. The Mineral Products Association (MPA) is the trade association for the aggregates, asphalt, cement, concrete, dimension stone, lime, mortar and silica sand industries. With the affiliation of British Precast, the British Association of Reinforcement (BAR), Eurobitume, QPA Northern Ireland, MPA Scotland and the British Calcium Carbonate Federation, it has a growing membership of 500 companies and is the sectoral voice for mineral products. MPA membership is made up of the vast majority of independent SME quarrying companies throughout the UK, as well as the 9 major international and global companies. It covers 100% of UK cement production, 90% of GB aggregates production, 95% of asphalt and over 70% of ready-mixed concrete and precast concrete production. Each year the industry supplies around £20 billion worth of materials and services to the Economy and is the largest supplier to the construction industry, which had annual output valued at £152 billion in 2016. Industry production represents the largest materials flow in the UK economy and is also one of the largest manufacturing sectors. For more information visit: www.mineralproducts.org. For further information, please contact Robina Longworth robina.longworth@mineralproducts.org; tel: 020 7963 8017.